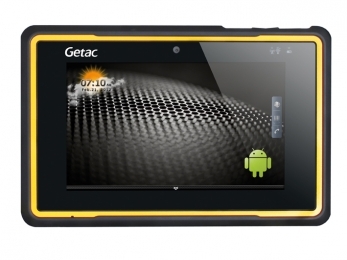 At home in the great outdoors in order to also be optimally prepared in the field, the compact Android tablet Z710 from Getac guarantees data exchange in real time. Its robust housing meets IP65 protection class standards, as well as the military standard MIL-STD810G for shielding when dropped from heights of 1.8 meters. The damage and scratch-resistant glass display has a screen size of 17.8 cm 7 and an integrated capacitive touch screen for multi-touch applications. Even with gloves it can be precisely and simply operated. Weighing in at 800 grams the Z710 is a real lightweight among robust systems. Inside, the powerful Intel Dual Core processor with 1 GHz is hard at work for you, and the operating system comes with Android 4.1. For quick processing power rely on the 1 GB RAM. Expand the 16 GB internal memory as needed simply via MicroSD. Next to the MicroSD card slot you will find a SIM card slot. Freely programmable function keys expedite processes, while the numerous interfaces USB, Micro-USB, as well as a PDMI docking port for transfer to RS232, VGA and HDMI simplify connection. Thanks to its excellent communication properties, you access data banks and web contents in real time, any time thanks to 802.11 b/g/n Wi-Fi, Bluetooth Class 2, WWAN HSPA, UMTS, GSM, GRPS, EDGE. Precise positioning anywhere is guaranteed by the powerful SiRFIV GPS module, which comes integrated standard. In combination with the altimeter, as well as the electronic compass, the Z710 is the ideal companion for operation and undertakings in the great outdoors. Even extreme temperature changes between -20 C to 50 C are no hindrance. While on the go, the 8,000 mAH battery ensures for an operating time up to 10 hours. For even longer usage you optionally receive an external battery, as well as a desktop docking station and a vehicle mount. A high resolution camera is situated on both the front and rear of the device. The front webcam sends in HD, while the rear camera provides 5 megapixels and LED flash. Optionally equip the Z710 with a 1D or 2D scanner, a RFID module and a magnetic card reader. Together with these options, you greatly expand your data capture possibilities. In potentially explosive environments Getac offers a special Atex-certified version Zone 2, so that you also comply with safeguarding measures in oil and gas processing.